Out of curiosity I soldered a second header into the board and it turned out to work flawlessly. Simple mod, although requires cleaning soldered pinholes and so it's not an easy task. A view of the circuit board showing the location of the extra IDE connector. In this example it is partially covered by the 'MAC ID' label. A view of Michal's modified board. At the right-hand end is the standard DOM fitted to its connector. At the left-hand end you can see the new connector that Michal has added. 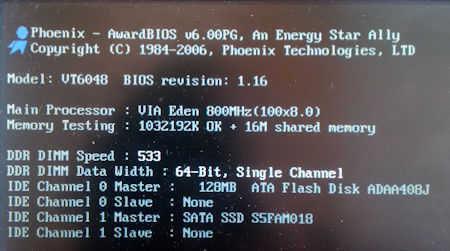 The BIOS display with another SSD plugged into the new connector.